In what key is the 'Song of Ice and Fire' composed? No minor key, that's for certain. I've just finished a six week 'total immersion' experience, reading all five available books in George R.R. 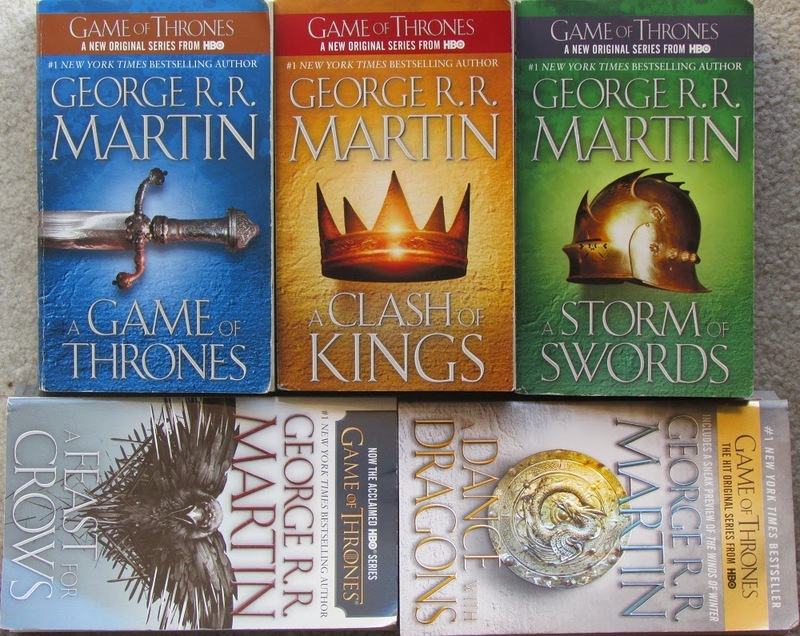 Martin's famous fantasy novel series, 'A Song of Ice and Fire'. This was an epic adventure, and I'm not just talking about the plot. It was quite a feat of reading. We're talking about plowing through five volumes--roughly 1000 pages each--in 42 days. I estimate that I read 40,000 words a day. And now that I've 'finished' - meaning only that I've caught up to the present (the series has two more books yet to be released) - I'm here to report some of my reactions to what I read as well as some insights into the man behind this truly epic project. What I write here is not exactly a book review, but it's not exactly not a book review either. Specifically, it's a list of seven subjective, sometimes off-beat observations. Let's call it "Seven Keys to the Seven Kingdoms": a look into the dungeons and secret passages in the hidden, unexpected underbelly beneath the castle--the untold 'story behind the story'. There's a lot of buzz about author George R.R. Martin right now, coming in conjunction with the October 28th 2014 release of his Christmas-gift-worthy coffee-table-book, The World of Ice and Fire: The Untold History of Westeros and The Game of Thrones. Martin has given several new interviews, both in print and on TV. Here's a link to a fine fifteen-minute interview with ABC's George Stephanopoulos broadcast late last week. 1. George R.R. Martin had his first 'fifteen minutes of fame' long before he started writing 'Game of Thrones'. He made his first TV appearance in 1987, four years before he even conceived of the 'Song of Ice and Fire' novels. It happened as a result of his position as one of four screen-writers of the short-lived TV series 'Beauty and the Beast'. 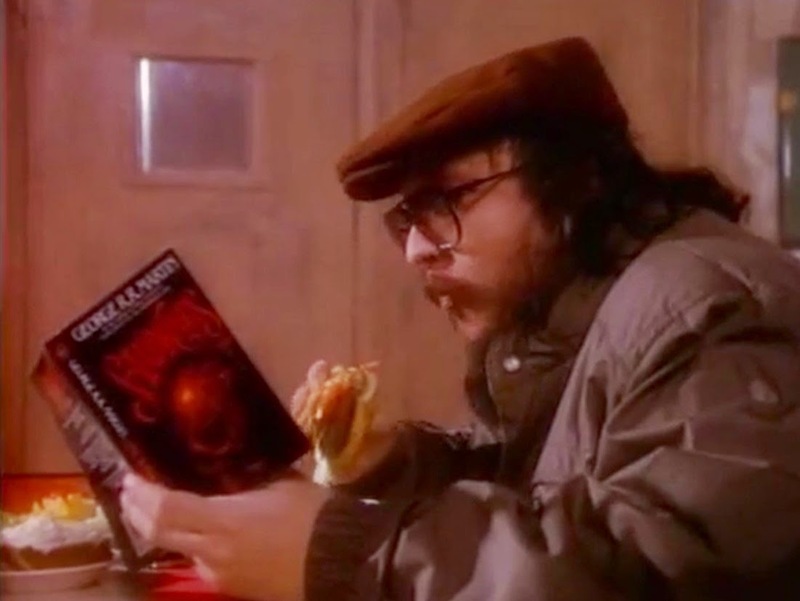 He made a cameo appearance sitting in a restaurant chomping a cheeseburger while reading one of his own books. In the Stephanopoulos interview, Martin says that it took eight takes to get the scene right--that meant eight big chomps on a soggy, luke-warm, microwaved cheeseburger. 4. You can't tell the players without a scorecard. The scope and ambition of this saga is unprecedented, as far as I know, in the entire history of alternate-world fiction. By Martin's rough count, he has written roughly 1000 characters into the story, all of which have back-story and entanglements with the main characters and with each other. Each of the five volumes published thus far has an extended appendix--an organized list of the characters and their relationships. These are EIGHTY PAGE rosters, consisting of nothing but lists of names. I chose to read the books without referring to those lists. If I didn't remember who somebody was (which happened often), I just assumed they weren't important enough to matter. That made some of the multi-page stretches of political scheming rather tedious if not downright boring but ... surprise ... it didn't cause me to lose the important threads of the plot. My take-away reaction: Martin could have written a 'normal' sized novel with far fewer characters on the page and, in my opinion, it would have been tighter, cleaner, crisper, with better pace. Would I use the word 'bloated' to describe the product as written? Would I do that? Nahhhhh. The readers adore Martin's attention to detail and the depth of the story as it is. The avid fans love being immersed in all the political nuances and intricacies. That these books continue to increase in popularity with every new release tells all that needs to be told. There will be an honored place in the history of literature for this work. One wonders whether some future author will try to outdo this feat. Just imagine ... ! Imagine an appendix the size of the New York City phone book. 5. The fantasy elements were (practically) afterthoughts. Yes, Martin's prime inspiration came from his dual-middle-initial counterpart J.R.R. Tolkien, but this little tidbit intrigued me: At one point during the writing, Martin was not going to include dragons. It took the prompting of a writer friend, Phyllis Eisenstein (to whom he dedicated the third book) to change his mind: "George, it's a fantasy - you've got to put in the dragons." 6. The key word is not Ice, not Fire, but Blood. Martin relates that as part of a high school essay assignment he rewrote the last scene of Edgar Allen Poe's 'The Pit and the Pendulum' to create a hideous bloody ending where the victim is slashed by the pendulum and dies in a pool of blood. Subsequently the rats come and eat out his eyes as the body festers. Sound familiar? His teacher praised his originality, and that positive reinforcement, coming as it did during those vulnerable formative years, has stuck with him to this day. In my review of the first volume, which appears elsewhere on this blog, I noted that Martin manages to include a bloody element in virtually every scene. One of the things that I did as I read, beginning with the second book, was to circle every occurrence of the word 'blood'. On average it shows up at least once per page. It seems almost an obsession with him. Martin has stated that he wants his novels to have the 'gritty feel of historical fiction', and he succeeds at that. Uncomfortable cruelty is a common theme throughout the books, with characters who seem critical to the story being brutalized, maimed, and/or just plain killed off. Furthermore, almost every significant character has some fatal flaw that, if it doesn't actually kill them, leads to bad decisions with major negative consequences. And underlying all that real 'grit' is the ubiquitous greasy slime of blood. "After all, as some of you like to point out in your emails, I am sixty years old and fat, and you don't want me to 'pull a Robert Jordan' on you and deny you your book. Okay, I've got the message. You don't want me doing anything except A Song of Ice and Fire. Ever. (Well, maybe it's okay if I take a leak once in a while?)" Just so long as you're not leaking blood, George. Live long and prosper.